BJP has decided to field a couple-Anna Saheb Jolle and Shashikala Jolle, from Chikkodi and Nippani constituencies respectively. 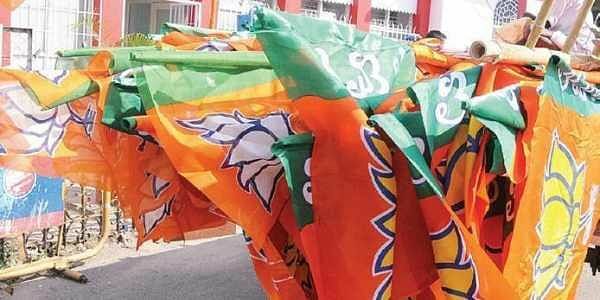 BELAGAVI: In an unprecedented move in the history of Karnataka politics, a national party-BJP has decided to field a couple-Anna Saheb Jolle and Shashikala Jolle, from Chikkodi and Nippani constituencies respectively. While the couple are happy with the gesture of the party high command, observers opine that the move was made to end the tacit understanding between the Jolle's and the Hukkeri family - who are with the Congress. While Shashikala is the sitting MLA from Nippani constituency, Anna Saheb has been selected as a candidate from Chikkodi. Shashikala, who will be contesting her third elections since 2008, has lost once and is looking to win for the second consecutive term. Anna Saheb, however, is contesting polls for the first time since he lost from Chikkodi-Sadalga with a BJP ticket in 2004. Speaking to Express, Shashikala said that her husband's candidature was declared 'suddenly', considering then work he has done for the party for the last two decades. Anna Saheb, who is one of the three district BJP presidents in Belagavi, said that he was contesting the elections due to pressure from party leadership and residents of the region. "There were discussions from many days regarding my candidature from Chikkodi, which has been realised in the second list," he said. Though the selection of the couple to contest in neighbouring constituencies has raised several eye-brows, observers say that the party high command has made the decision to prevent a covert alliance with Congress's Prakash Hukkeri, Chikkodi MP. Prakash's son, Ganesh Hukkeri is the MLA from Chikkodi assembly segment and was elected in 2014, after Prakash vacated the MLA seat in 2014, and was elected as MP. According to Ashok Chandargi, the activist from Belgaum, following the victory of Shahsikala in Nippani and Prakash in Hukkeri, the victory rally was taken out almost together by the two. "Photographs of the same had even reached Chief Minister and high commands of both the parties. I think BJP has given ticket to Anna Saheb to give serious contest at Chikkodi, where Ganesh would have won easily," he said. Sources also added that Anna Saheb and Prakash enjoyed a good relationship as both of them hailed from Examba village, located close to Maharastra border. "That was one of the adhesives for their understanding which stretched beyond their party affiliations. However, Anna Saheb's contest from Chikkodi may strain that relationship and result in neck to neck contest. If not for Anna Saheb's candidature, Ganesh Hukkeri would have all but won," the source added.